The pensions market is still in a period of much change which drives the need for alternative planning opportunities. Dermot Campbell, Chief Executive of Kuber Ventures, the alternative investment platform for EIS, SEIS and BPR investments, talks about using EIS investments as an alternative to pensions for High Net Worth individuals. Since the so-called ‘A’ day pensions simplification legislation was introduced, more pensions legislation has been introduced than we ever had before,leaving adviserswith the challenge of keeping on top of the new rules and retrospective changes. There are ongoing discussionsof further restrictions to theLifetime Allowance, reductions in tax relief and even talk of the UK moving to an American style 401k type pension. We all know that the 20 times calculation for final salary scheme valuations is far removed from current transfer values and, were the Government to change this calculation basis, then a significant number of clients would be pushed over the lifetime allowance. Pensions freedom gave a number of clients the option to diversify their pensions pots into other investments and this has had the unintended consequence of boosting investment in buy to let properties. Now, the Government is scrambling to constrain this by increasing the tax and compliance burden on property investors. With increased access to pension pots and the certainty of annuities being slowly removed from the market and thereby leaving less competition, it seems that as far as retirement planning goes, cash is becomingking – so what other retirement planning options are open to the high net worth investor? What the Government has really tried to achieve in constraining the benefits of pensionsis to encourage peopleto invest in a way that will help to boost the economy. This is why there has been so much rhetoric about stakeholder ownership and venture capital investing using venture capital trusts (“VCT”s), enterprise investment schemes (“EIS”) or seed enterprise investment schemes (“SEIS”). Pensions should always be the starting point for retirement planning. The reason is that pensions are specifically designed for retirement planning what with the tax relief on contributions, the pension commencement lump sum, bankruptcy protectionand restrictions on when you can access the capital. The issue is that you just can’t put enough into a pension anymore. Pension freedoms, along with the restrictions on both lifetime allowances and contribution levels,are sterilising many of the key benefits that pensions previously came with. Many advisers are looking to other investment media to help with their clients’ retirement solutions. Enterprise Investment Schemes and Seed Enterprise Investment Schemes (EIS & SEIS) provide a great example of such alternative solutions, offering bothup-front tax relief and tax free returns at maturity together with inheritance tax efficiency. Because of the high risk nature of these investments (like the AIM market they are unlisted shares), many IFAs have been put off considering this route in the past even though they regularly recommend clients to invest in fairly riskyAIM ISA arrangements. In addition, many IFAs consider the EIS/SEIS market to be a lump sum solution which is not suited to those clients who want to make regular contributions.What many may not be aware of is that there is, in fact, a regular premium route into this market. The EIS market is a contract which gives the investor 30% income tax refund, IHT free status after 2 qualifying years and returns free of income and capital gains tax. In addition to this, there are very generous investment limits (£1m per annum for income tax relief with the ability to go back a year for both contribution and income tax refund) and the ability to defer capital gains. If you invest into an EIS arrangement and if you haven’t invested into an EIS the year before, then you cancarry forward the previous year’s £1m premium allowance for income tax refund and use it on top of the current year’s one, therefore potentially giving you a £2m investment in the current year – just try putting £2m into a SIPP! The Income Tax reducer is at 30% and this is a reduction against all sources of income tax. As this is a reducer, you will want to maximise its effect to its full extent by using contribution levels that should ideally be targeted to a level where the 30% tax reducer does not exceed the income tax paid. An interesting side note is that a typical EIS arrangement runs for about 5 years and when it matures it can be reinvested in another tax efficient investment, potentially giving further tax relief. Given that the EIS tax reducer stands at 30% and a higher rate tax payer could be receiving 40% tax relief on his pension contributions, using an EIS may prove to deliver greater tax benefits. Let’s suppose Mrs X invests £1000 in an EIS. She receives an initial £300 tax rebate and holds the investment for 5 years until it matures, delivering £1,200 tax free, assuming there has been a 20% growth. Mrs X then reinvests the maturing EIS arrangements back into another EIS and receives a further £400 in tax relief. The investment matures in a further 5 years at which point she can decide to spend the benefits, or re-invest. The final proceeds, assuming a repeated 20% growth, would amount to £1,440. Effectively, an investment of £300 grows to £1,440 after tax. 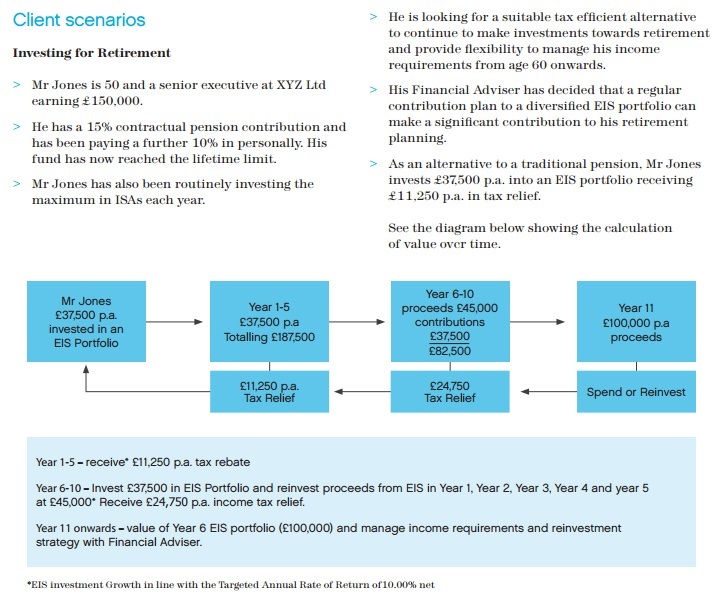 In contrast, were she to invest this £1,000 in a pension, assuming the same growth rates, she will receive £400 in tax relief upfront making the initial investment a net £600, and the investment proceeds will be £360 as a pension commencement lump sum, and £648 as a post-tax remaining fund. In this case, £600 net investment has grown to £1008 after tax. From an IHT point of view, funds invested into an EIS are free of IHT after they have been under qualified investments for a 2 year period. Although this is a good IHT relief,care should be taken if the client is not utilising the income tax reducer, CGT deferment or both. Cautionalso needs to be taken on maturing EIS arrangements as, from the time they leave an EIS arrangement until they return to another qualifying business property relief (BPR) under the replacement property relief rules, they fall back into the individual’s estate for IHT purposes. That said,there are a number of different BPR qualifying investments including the likes of EIS, SEIS, most AIM investments and BPR (both portfolio and individual arrangements) available for you to reinvest back into. An EIS can also be used to defer a Capital Gain and therefore defer the payment of capital gains tax to a later point. When you are deferring a tax bill of up to 28% and receiving a 30% income tax reduction then you can see how valuable this tax incentive is. Combine this with IHT relief and it looks to be overalla very good package solution. EIS arrangements do not have a secondary market and, once you’ve invested, you have no access to those funds until they mature. Again, for retirement planning this disadvantage can be covered by creating multiple arrangements through a regular premium which would mature at differing time points, giving the clients the option to take tax free funds or roll them on as a tax reducing investment. So, this all sounds too good to be true – surely there must be some drawbacks? As these types of investments generally involve unlisted shares, they are high risk and so care needs to be taken when looking at this market. One of the key ways to lessen risk is, of course, to diversify – a lot. Investing in funds via a platform and thereby using a selection of fund managers is one of the best ways to achieve this. Another method is to use regular premiums as when each investment is made most EIS managers are investing into new projects when existing projects close and therefore you get multiple investments even with the same manager. This is exactly what we do at Kuber Ventures; we collate the due diligence information you need, negotiate terms with the managers and allow advisers to easily access a range of funds for their clients. We offer both lump sum and regular premium investments via an investment platform that reducesthe administrative burden that a diversified portfolio can often cause for IFAs. Are pensions dying? No – but they may take a different form. Plese look at our example in infographic. Please read the following information carefully as a professional adviser. This is not advice only guidance. Kuber are not tax advisors. The information contained in this flyer is for discussion purposes only for professional advisers and their clients. It is not for Retail Clients. EIS Funds are not suitable for all investors as the underlying investments are often illiquid and therefore high risk. Advice should always be sought from a professional adviser prior to investing. For purposes of compliance with the UK Financial Serv ices and Markets ACT 2000 (FSMA), this material is communicated by Kuber Ventures; and the contents of this financial promotion have been approved for the purposes of section 21of the FSMA by Sturgeon Ventures LLP which is authorised and regulated by the Financial Conduct Authority (FCA) and it has its trading office at Linstead House, 9 Disraeli Road, London SW15 2DR. Kuber Ventures Limited advisors’ are all regulated by the Financial Conduct Authority (FCA) and can be found on http://www.fca.org.uk/ Kuber Ventures Limited [FRN 574987] is an Appointed Representative of’ Sturgeon Ventures LLP which are authorised and regulated by the Financial Conduct Authority (FCA). Kuber Ventures Limited, 25 Sackville Street, London, WS 3AX, registered number, 8693809, VAT, 175 9290 69.